While they were originally bred to retrieve waterfowl for hunters, and they still perform this duty today, golden retrievers have successfully crossed into all roles of canine athlete and assistance dog. Owners of golden retrievers compete in field trial and hunt tests, agility, flyball, obedience trials and the conformation ring. They are also used extensively in search and rescue, detection (from narcotics to agriculture to explosives), as guide dogs for the blind and as therapy and assistance dogs. Hunters seeking a reliable waterdog should take care to select a puppy specifically from hunting lines – those proven in the field or that have found success in the field-trial or hunt-test circuit. With their great popularity in the show ring and other venues, a split has taken place that has resulted in different body styles, which are not ideally suited for the rigors of the field, and varying degrees of prey drive. Psychologically “softer” than many other retrievers, specifically the Labrador, golden retrievers don’t always take corrections well and often require a more deliberate and positive approach to training. Indeed, with such a high degree of trainability and such a pleasant and empathetic personality (and dogs do show empathy, as this study suggests), golden retrievers have become favorites in the therapy world. This recent news story out of New York – about a therapy dog that was allowed to comfort a child on the witness stand during testimony – epitomizes the empathy and value of the breed’s personality. With so many great traits, it’s no wonder golden retrievers are consistently among the country’s most popular dogs. However, if you’re thinking of getting one, whether to compete or just as a family pet, there are a few considerations to ponder. First, goldens are working dogs, and as such they require exercise and interaction – leaving them in a backyard all day will likely result in dysfunctional behavior, such as digging, barking and chewing. Keeping their minds as challenged and active as their body will relieve this stress and will go a long way to making a happy dog and happy home. 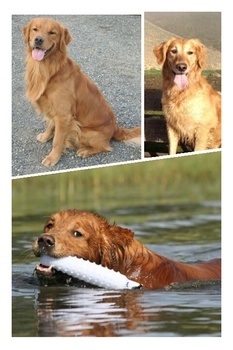 The second point to consider is that golden retrievers possess a thick, long-haired double coat that requires much care. Brushing will become a necessary part of your routine, but even that won’t keep your clothes from attracting the long, light-colored hair. If you’re planning on hunting your golden retriever, grooming becomes even more important (and problematic) – many sportsmen shave the dog prior to the start of the season to reduce issues with burrs and other grasses, as well as to help alleviate heat stress. Even with routine grooming, you’ll likely want to invest in a good vacuum (I suggest the Dyson Animal line of vacuums…seriously, it’s worth the cash). The final consideration when choosing a golden retriever is health. Like many other breeds, goldens are prone to hip and elbow dysplasia, as well as eye issues – from entropion, or the inward curling of the eyelid, to cataracts. When selecting a breeder, you should choose one that has screened their breeding pair for known genetic mutations. At Paw Print Genetics, we offer a panel test for golden retrievers that includes dystrophic epidermolysis bullosa, sensory ataxic neuropathy and ichthyosis (currently, Paw Print Genetics is the only laboratory in North America that offers screening for this skin disorder).